You are curenlty in Fortis Entrust™ Ostomy No Sting Pectin-Based Paste 2 Oz Tube made by Fortis Medical Products and asigned to category. fortis Entrust™ Skin Paste With Pectin - No Sting Formula Is Formulated To Handle High Liquid Output As Well As Thick, Heavy Output. The Paste Is Thick, Yet Pliable For Ease In "caulking" Around The Stoma Or Filling In Gaps, Scars, Folds And Uneven Skin Surfaces. It Can Be Used To Hug The Stoma And Create A Seal That Expands To Fill The Empty Space Between The Appliance And The Stoma, Which Can Create Leaks. Because Stoma Size Can Change Throughout The Day, The Paste Helps Maintain The Seal For Added Security And User Confidence. Fortis Entrust™ Skin Paste With Pectin Is Specially Created To Be Less Sticky But More Tacky To Create A Good Seal Without An Unnecessary Mess And Residue On Fingers. No Sting Formula Contains Lower Alcohol Content Than Standard Entrust™ Skin Paste With Pectin. Helps Protect The Stoma From Small Nicks Sometimes Caused By Ostomy Appliance Edges. Skin-Friendly; Helps Maintain Healthy Skin Around Stoma. Helps Minimize Leaks Due To "pancaking." Can Be Used With Skin Barrier Rings. Safe To Use With Fortis And Other Ostomy Brands. You have selected Fortis Entrust™ Ostomy No Sting Pectin-Based Paste 2 Oz Tube from Ostomy Supplies. We hope that this Fortis Entrust™ Ostomy No Sting Pectin-Based Paste 2 Oz Tube made by Fortis Medical Products is what you were looking for. If you have any questions about this particular Fortis Entrust™ Ostomy No Sting Pectin-Based Paste 2 Oz Tube or any other products from Ostomy Supplies, please call us. We have an experienced staff that will gladly help pick out the correct Fortis Entrust™ Ostomy No Sting Pectin-Based Paste 2 Oz Tube for you, also. 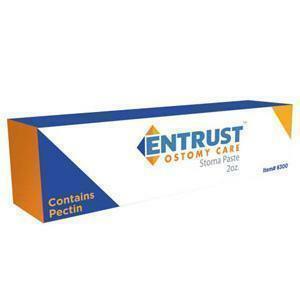 If you are looking to make a purchase of Fortis Entrust™ Ostomy No Sting Pectin-Based Paste 2 Oz Tube in large quantity or you are a Hospital or Medical facility and need help on making a purchase of Fortis Entrust™ Ostomy No Sting Pectin-Based Paste 2 Oz Tube made by Fortis Medical Products, please contact us.